What's the average life span of a marriage or relationship? The average length of a marriage that ends in divorce is eight years. People wait an average of three years before remarrying( if they remarry at all). The average age for couples going through their first divorce is 30 years old. The average life span of a romantic relationship is 3.5 years, with many jumping right back into another one within the same month or year. When you think about the facts provided it's no surprise that divorces are at an all time high. Also when it comes to commitment most people are more loyal to their career, jobs and even their pets, then they are to their significant other. With these known facts its a wonder that people these days still celebrate and share one very important rare occasion their Anniversary! If you happen to be reading this and have been with your significant other for more than 8 years, then the both of you happen to be in rarefied air! In fact as a couple you both, are unique or different from the rest and if mention to anyone would be congratulated by anyone you both mention this too. Even though most people enjoy these days jumping form one relationship to the next, all of them would love to be with someone that they could share and then celebrate their anniversaries with. Why? 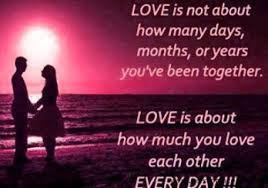 Because being with someone you love for a long length or periods of time is an awesome life long accomplishment! It takes hard work, a strong commitment to each other, tremendous patience, prayers, support, understanding and loyalty that most don't or won't understand. 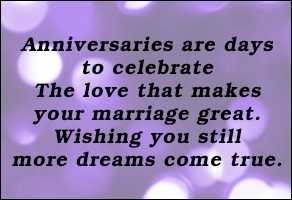 While most people celebrate getting married, the true celebration is having many anniversaries. Anyone can get married, start or jump into a new relationship, but it takes two strong committed, loyal people to share, then celebrate a Anniversary! Its saying to yourselves and to the rest of the world that through it all we both have made it together to share another Anniversary! Write in then express your thoughts or feelings on the subject.